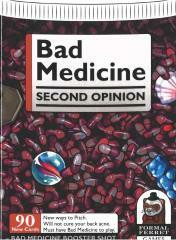 Expand Bad Medicine with this Booster Shot! Here are 90 new Drug Cards with silly names, compelling descriptions, and awful side effects. You can also play with a new “Complication” mechanism that makes your pitches even more hilarious and memorable. Now get out there and start making hilarious pharmaceutical drugs!